A Florida-based nonprofit group covered the costs of 40 coffins so impoverished Nicaraguans could begin burying their dead. MIAMI — In April, as a nationwide protest demanding the ouster of President Daniel Ortega took over Nicaragua and students began occupying the national university, four friends in Miami formed a nonprofit group to provide mattresses for the students. “The students were tired. They were sleeping on the floor,” said Ana, one of the co-founders of the group, the Nicaraguan American Center for Democracy, who did not want her real name used to protect the safety of her family in Nicaragua. Human rights groups say that at least 275 people have been killed since the protests began two months ago on Thursday, which is the 39th anniversary of the Sandinista revolution. As the situation in the Central American nation deteriorated and the death toll began climbing, the Ana's group quickly realized there was a need for coffins. 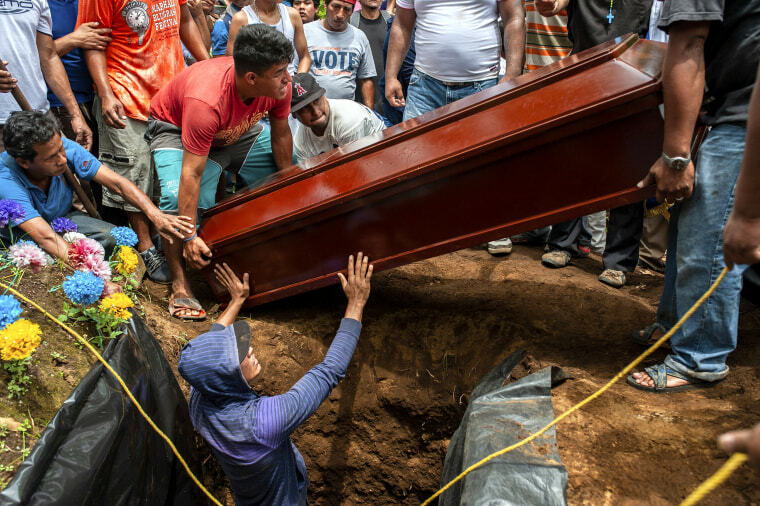 Nicaragua is the second poorest nation in the hemisphere and many relatives of those killed can’t afford the $200 for a coffin. This week, the group covered the costs of 40 caskets, so families could begin burying the dead after a bloody weekend where police and paramilitary groups attacked roadblocks set up by anti-government protesters. Ana, 43, who left Nicaragua for Miami 11 years ago, said she was never prepared for this kind of brutality. “It’s difficult to process the level of atrocities,” she said, fighting back tears. The tensions in Nicaragua began after the government announced cuts to social security. Although it quickly backed down on cuts, the protests expanded into demands for Ortega to step down. Opponents characterize Ortega, who was elected in 2006 and whose wife is vice president, as a dictator and accuse him of nepotism. Rights groups have accused security forces and groups loyal to the government of using “lethal force” against opponents. The government says the protesters are trying to stage a coup against Ortega as they try to crack down on the protests. The latest attack took place on Tuesday when Nicaraguan police and armed pro-government civilians stormed the neighborhood of Monimbó in the city of Masaya, which has been a center of the opposition since protests began. They tore down barricades that had been erected by the opposition during a clash that lasted hours. It is not known if any deaths resulted from the confrontations in the largely indigenous town. Francisco Palmieri, the U.S. assistant secretary of state for western hemisphere affairs, tweeted on Tuesday: "We strongly urge President Ortega not to attack Masaya. Continued gov't instigated violence and bloodshed in Nicaragua must end immediately. The world is watching." We strongly urge President Ortega not to attack Masaya. Continued gov’t-instigated violence and bloodshed in #Nicaragua must end immediately. The world is watching. Coincidentally, Masaya was a stronghold of the Sandinista movement, which Ortega was part of, during the Nicaraguan revolution that overthrew U.S.-backed dictator Anastasio Somoza Debayle in the 1970s. The Sandinista National Liberation Front, or FSLN, is a leftist political party in Nicaragua and its members are known as Sandinistas. Ortega was previously in power from 1979 to 1990. “The regime is willing to go very, very far to stay in power,” said Frank Mora, a former Pentagon official who heads Florida International University’s Latin America and Caribbean Center. Mora says the Nicaraguan military is “an institution to watch.” The military has largely remained neutral up to this point, but they have political, corporate, and economic interests that could be threatened by the political instability in the country, according to Mora. “So how this plays out and the calculations the army makes to turn against the Nicaraguan government is curious to see," he said. On Friday night two university students were killed when over 200 students sought refuge in a local church after police forced them out of the national university, which they had occupied during the past two months of protests. The students were freed after a 16-hour ordeal. The Nicaraguan American Center for Democracy supplied coffins for the two students killed. A Roman Catholic bishop, Abelardo Mata, was attacked as he was traveling in a car to a funeral. He sought refuge in a nearby home and was unharmed. But it was the second time in a week that a Catholic official was attacked. Catholic officials have been mediating stalled talks on finding a peaceful solution to the standoff and have criticized Ortega’s government over the killings. Mora says that although international pressure is important, it’s only secondary to how far the opposition is willing to go in their confrontations. He said that despite the “grotesque” violence, “Nicaraguan people are still out there fighting, confronting, occupying, refusing to go home. And this is an important element of this." As Ana and her group raise money to provide coffins for those killed amid the violence, they are already planning for the future of the country they left behind.